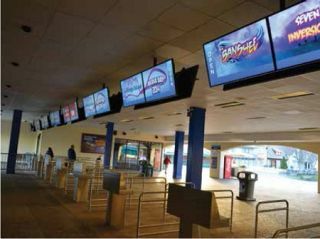 Entry digital signage at Cedar Fair amusement park helps direct the flow of traffic. Cedar Fair Entertainment Company wants waiting in line at its amusement parks to be just as enjoyable as riding the ride itself. Well, that might be a slight exaggeration. But as “always on” technology becomes a mainstay, Cedar Fair knew it had to seek a new way to entertain riders waiting in line. So, the entertainment company turned to SunBriteTV’s outdoor displays to entertain guests in eleven of its major amusement parks. In an aggressive deployment timeframe of just eight weeks, and an inclement weather schedule that included rain, sleet and a polar vortex, Reflect Systems chose SunBriteTV’s outdoor televisions for their ease of installation and weatherproofing technology, which has been known to withstand the elements across North America. So far, they have proved versatile and reliable tools in delivering necessary information and entertainment to Cedar Fair’s 23 million annual guests. With more than 350 screens across eleven amusement parks, including Cedar Point, Knott’s Berry Farm, Kings Island and Canada’s Wonderland, the digital experiences start immediately once guests arrive. Entry gate digital signage is utilized to help direct the flow of traffic. For entry gate screens, Reflect developed a custom software application to dynamically control lane status for guest entry, indicating which lanes are open or closed. The application also provides custom content and messaging capabilities to designate lanes reserved for groups and VIP s, and can also be used to promote special events. Multiple screens throughout the parks provide guests with entertainment and information. Reflect developed dynamic content, including a custom weather package to inform guests when to expect the hottest or coldest hours of the day, or inclement weather, allowing them to plan their day accordingly. The ReflectView enterprise digital media software suite provides Cedar Fair control over the management, distribution and presentation of HD media content and applications. Reflect also tested all audio while parks were in operation to ensure that the audio was clear and audible in such a noisy environment. Additional audio and visual technologies implemented at the parks included interactive wayfinding kiosks developed and installed by Reflect, and dynamic content/social media feeds curated by Reflect and displayed on al SunBriteTV displays throughout the parks. Reflect deployed more than 350 SunBriteTV Pro Series 55-inch outdoor displays across the 11 parks. Featuring direct sunlight-readable LED screens with high temperature Enhanced Solar Tolerance (EST) technology, the Pro Series offers a consistent image in all lighting conditions. Multi-fan airflow and temperature regulation systems keep internal electronics running in temperatures from -40 degrees to 122 degrees Fahrenheit and a watertight cable entry system seals out moisture, insects, dust and foreign particles. Inclement weather was a factor even before the installation was complete. Reflect had to perform within an ambitious timeframe of eight rainy weeks in order to finish the job in time for the start of the 2014 season. “There was a lot of snow and we had to get creative to keep equipment dry while mounting. We had to be mindful and knowledgeable of all the parks’ safety requirements. We are proud to say that we adequately worked within all safety regulations and completed the installation in all eleven parks with no incident,” Rivera said. Amirah Mercer is digital editor for SCN and Residential Systems.